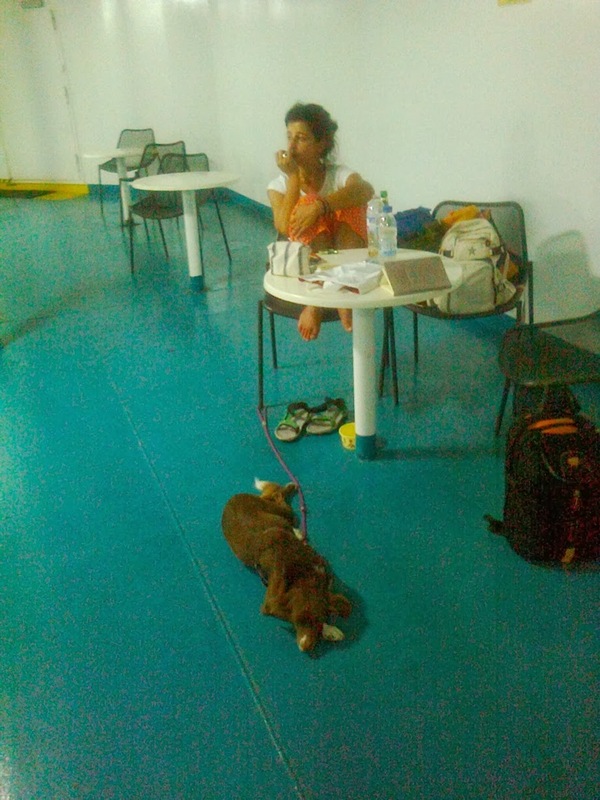 I made the mistake of taking Sage for a trip to Athens, by ferry, when she was just a young pup. 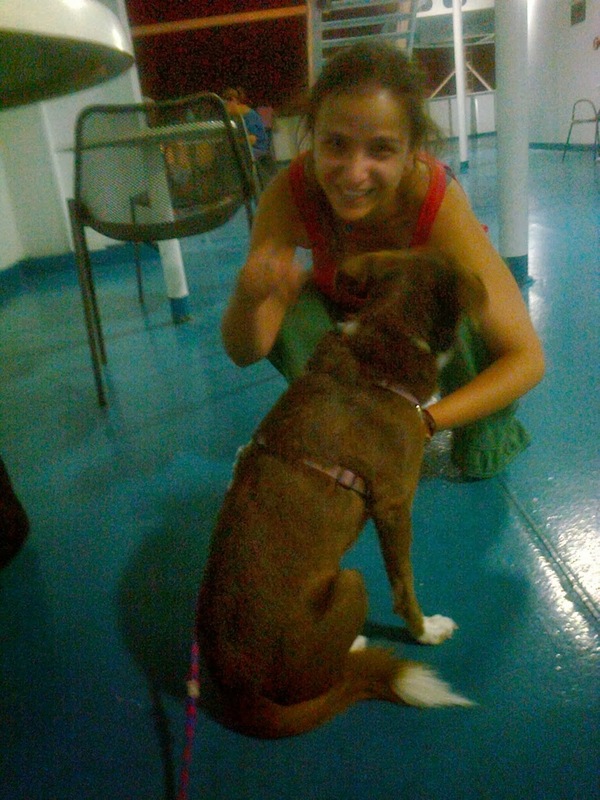 It was selfish of me, I wanted to celebrate my birthday with friends in Athens, and to show off my beautiful new dog. 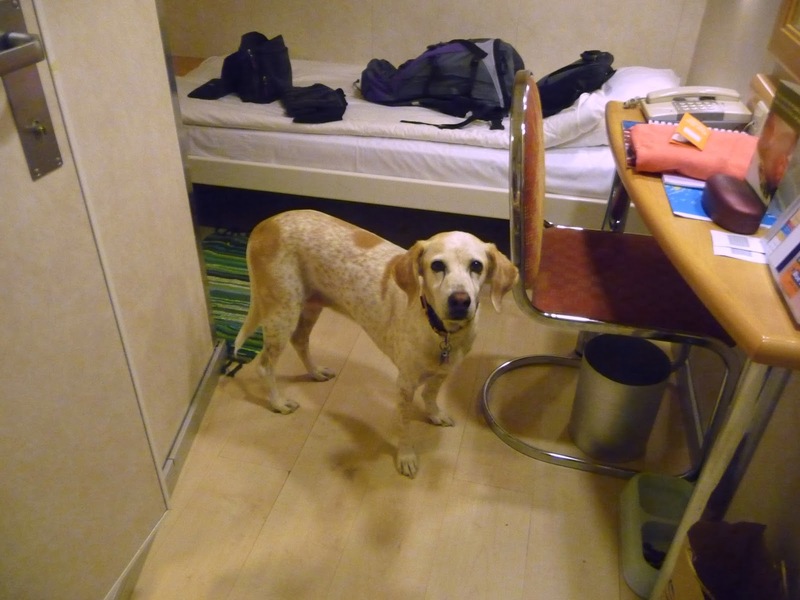 Arriving at the port in Heraklion, Sage immediately became skittish due to the loud noises and unusual smells of the ships and the sea, the passengers and the cars, the chaos. I had to coax her onto the gangway, amid a crush of people and luggage. Although young, she was a big girl even then, and people were pushing to get out of her way, tutting and looking annoyed. The situation didn't get any better. 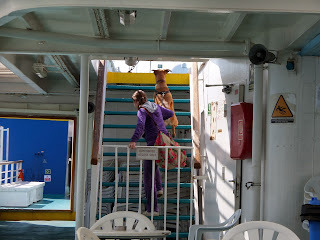 The dog-friendly area was right at the top of the ferry (this was Minoan Lines by the way), through various cafes and lounges, and up lots and lots of progressively steeper and narrower steps. Even the tried and tested method of holding a biscuit in front of her nose couldn't tempt her up the last few steps. So I had to carry her. And my bags. She was then about 20kgs. We sat freezing on the deck for a few hours. This was January. Every time I left her to run to the bathroom, or go to buy something warm to drink, she got distressed and started barking uncontrollably. 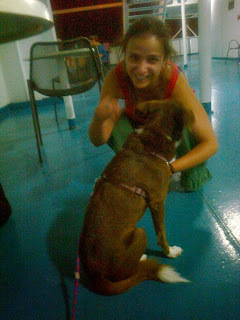 Eventually I put her in the kennels, right at the top of the ferry. These kennels are fairly exposed to the sea winds, especially during a cold January night. 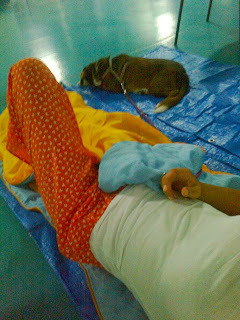 By the time I let her out, early next morning, she was freezing cold, frightened and disoriented. The journey back to Crete was better, as we travelled during the afternoon, but still was not ideal. I haven't done this journey again since then. After spending so much of our time traveling around Crete (and now Cyprus), on all forms of transport, I don't think this ferry journey would bother Sage much these days. 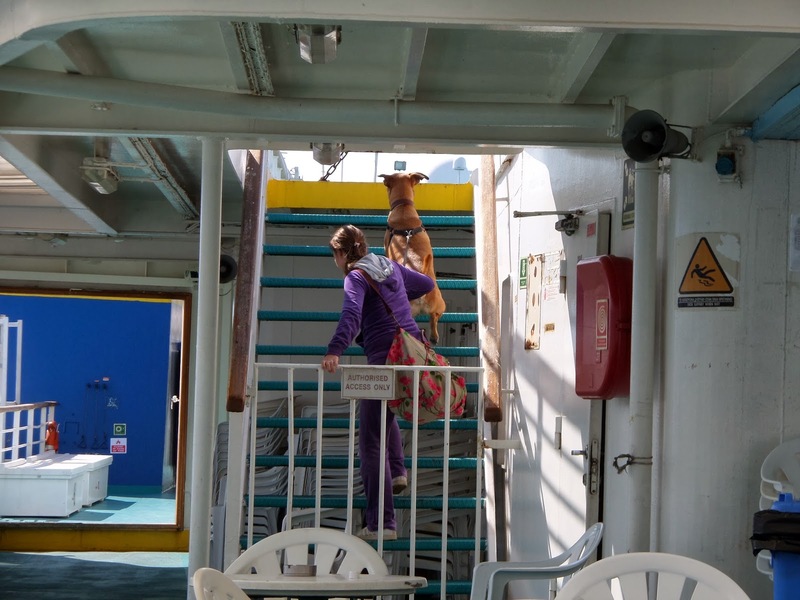 But for anyone feeling unsure, I have summarised the experiences and advice of friends of mine who regularly manage long ferry trips to and from Crete...with their dogs. This type of ferry travel might not be for everyone, however. My friends stay on deck with Mayia, summer and winter. They make a camp with sleeping bags in the most sheltered area of the deck (dogs are not allowed inside the ferry), and tether Mayia to a table or post to ensure she stays close by. In this case, your dog travels for free, and the only cost is your own ticket, at the cheapest rate (usually called 'economy' or 'deck'). While this might be fun with a group of friends, every once in a while... maybe... it's more difficult if you are travelling alone, or have any obligations the following day and don't want to arrive exhausted, or simply if you are not that fond of camping outside on ferries! As she was getting older and frailer, Garby was treated to a night in a dog-friendly cabin at the end of this summer, as my friends travelled back to Athens. They also found ANEK lines to be the cheapest and best option. 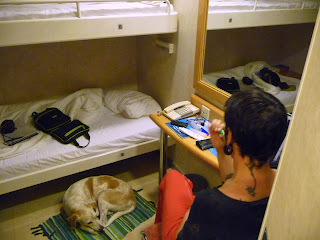 This option does cost more - I think about 80 Euros more than an ordinary cabin (ie without dog), but it does mean that you get a chance to sleep during the journey, without worrying about your dog. My friends kindly reported back to me about their journey. The main difference between the dog-friendly and the normal cabins are the lack of carpets in dog cabins, and the fact that these are clustered together out of the way of the other (sleeping) passengers. Sensible measures! The website recommends that you book these cabins well in advance (particularly during the busier seasons). I would also say that there are often price deals on these ferries, and it's worth doing some research to find out current deals and promotions. 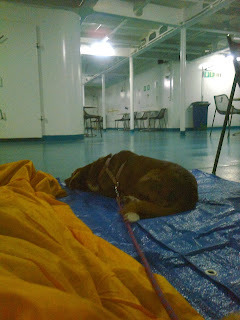 You may want to carry your dog's blanket or rug, to help them feel more at home in the strange environment of the ferry. My friends would put Guinness into the kennels for short periods of time, so they could sleep for a couple of hours, or go and buy something to eat. Rhodes to Heraklion (or further, the ferry continues on to Athens eventually...) is a long haul - probably too long to camp out on deck! 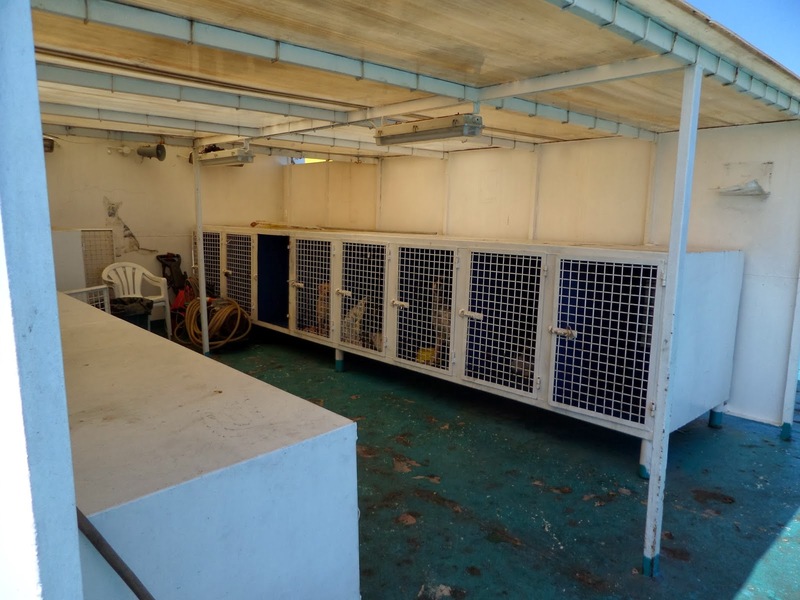 So my friends made sure they were well organised (carrying a water bowl that is almost impossible to spill, for example, and stocking up on food they might need, in order to limit the times they had to keep Guinness in the kennels). Guinness was also travelling with ANEK, as there are few companies that run this route. He was travelling for free. 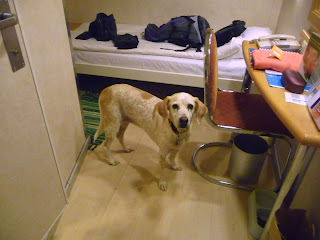 After the feedback from various friends, I have to say that ANEK does seem to be more dog-friendly than the other options (NOTE: ANEK and Superfast Ferries run some routes as a joint venture, but it is the ANEK-owned ferries, such as Olympic Champion which have proven to be the most convenient for travel with dogs!). As a final note, I wanted to write briefly about leaving animals in cars in the garages while on board. I heard of a recent tragedy involving hunting dogs who were left in car trailers in the ships' garage, and were tragically killed. 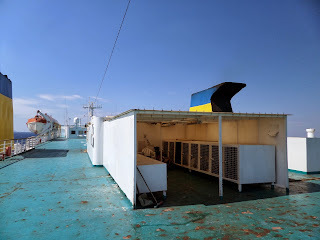 As there are facilities on board, there does not seem to be any reason to risk your dog over-heating, freezing, suffocating from endless car and diesel fumes etc etc. Simply, don't take this risk.